Spain is a beautiful country located on Europe's Iberian Peninsula, covering 17 regions with a variety of geography and cultures. Cities like Madrid, Barcelona, and Valencia are some of the most fantastic places to travel to see popular destinations such as the Gaudi buildings, the Royal Palace & Prado Museum of Art, mountain villages, and more. Travelers looking to explore the best regions and islands of Spain can do so by participating in some of its many cultural traditions, from paella to wine. Spain is also famous for its glorious beaches, fantastic architecture, and stunning art. Visitors looking for a comprehensive experience of Spain's culture can indulge one of its many diverse festivals, from Semana Santa, to San Fermin, to the Tomatina Tomato Fight. The Spanish are not Puritans. Even the most somber religious festivals, such as Semana Santa (Easter) or Corpus Christi, have solemn processions and church services, and still offer festivities such as tapas or a glass of wine. Easter Holy Week, for example, is a major Catholic Holiday celebrated in Spain with performances of penance processions in the streets. Corpus Christi in Spain is a Christian festival that is celebrated similarly, except this one has a "Dancing Egg" where the people of Barcelona place an empty white eggshell on top of the water in local fountains to make them dance. This egg is a symbol of the body of Christ, while the water reflects a renewal. The tradition says that if the egg doesn't break, the new year offers prosperity. A city’s patron saint or other holy celebration often evolves into hopping street parties, such as the ones that every city or village hold every year. The biggest one is the Las Fallas Festival in Valencia. This festival involves the construction and burning of the Fallas sculptures, the Mascaleta audio firework display, firecrackers in the street, and more. Another good street party is the Feria de Agosto, Malaga's big festival in August. This week-long party will leave travelers with memories of flamenco and sherry, fun firework displays and dancing, and uniquely decorated lanterns and flags. There are also world famous and wacky celebrations in Spain, like Tomatina Tomato Fight, one of the world’s biggest food fights. 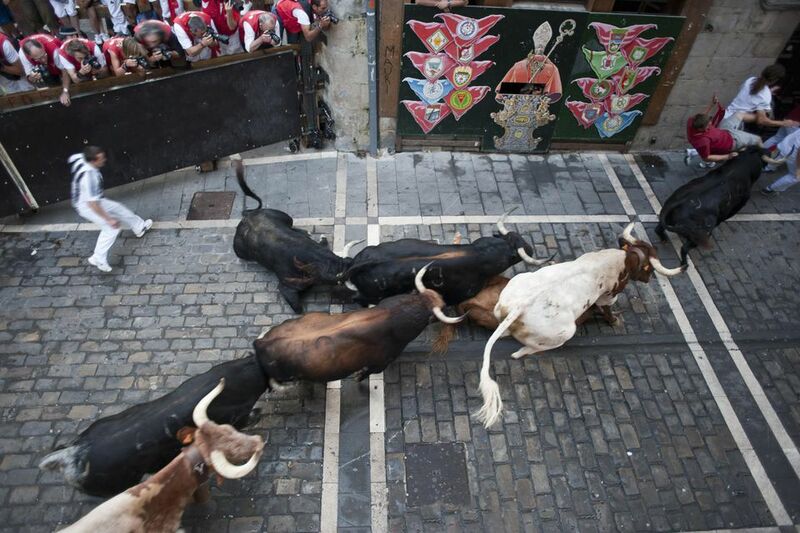 There's also the Pamplona Running of the Bulls, where attendees can expect bullfights, night time partying, and other festivities. Additional events like El Colacho and the goat toss in Manganeses de la Polverosa also top Spain's most bizarre festivals. Music festivals are also plentiful in Spain for those looking for something more comfortable to home. Whether it's traditional flamenco festivals like the popular Biennial in Seville or the classy jazz festivals in the Basque Country, there's something for everyone when it comes to genres like cutting-edge rock, pop, dance, and more. Other popular types of festivals in Spain include film festivals and sports events. For example, the San Sebastian film festival is the most famous one, but there are niche festivals to please every genre including comic books, horror, gay and lesbian, and erotica. Spain is also ​​a leader in world sports and offers soccer (futbol) games and weekly matches on TV and in person. Catch a game at a local bar if you can't make it to the stadium. Which Traditional Festivals Should You See in Spain? Where Can You See a Bullfight in Spain... and Should You?